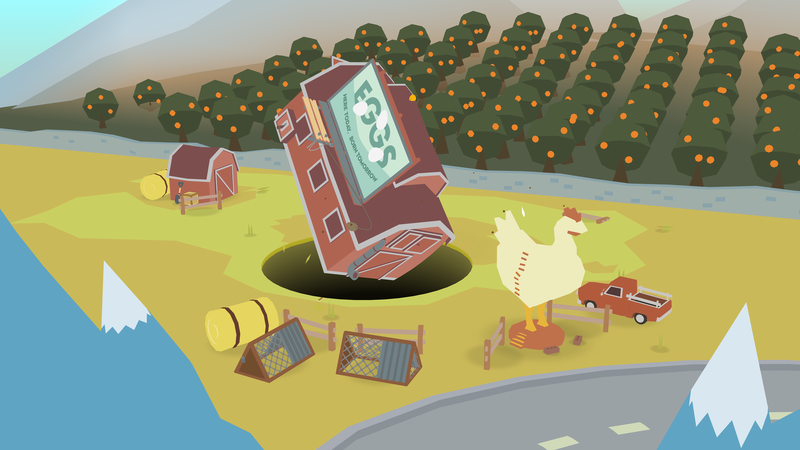 There are a lot of genres and subgenres in games these days, but it’s hard to pigeonhole Donut County into one. I suppose it’s a puzzler, but “hole simulator” might be more appropriate. And besides, I don’t think the “inverse-Katamari-Damacy” genre will ever catch on. 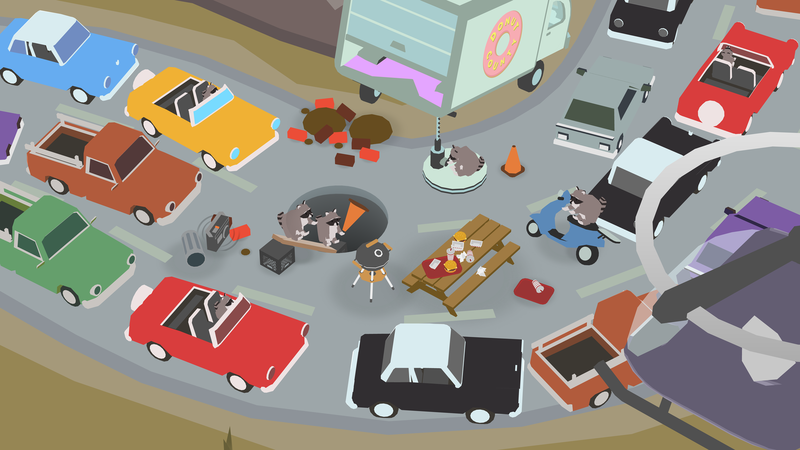 Donut County sees you take control of a hole that spawns around various locations in the titular town. You move the hole along the ground, attempting to swallow up everything in your path. As you do so, the hole becomes wider, allowing you to gobble up larger and larger items and structures until each level is a barren wasteland. The items then fall deep underground to remain there. And with that begins the story. It’s mostly about Mira, a young girl, who has befriended a raccoon called BK. The raccoons run a donut shop in town (because why not?) and Mira is employed to help them. The issue is whenever a resident of Donut County orders a donut, what they’re actually ordering is a hole, which ends up sucking them into oblivion. As such a lot of the residents end up nearly 1,000 feet below the surface and recall to each other their story on the surface before they were sucked under. Reminiscing these memories forms the levels the player must complete, and what follows is a short tale of deception, the definition of trash, and some quirky dialogue. The gameplay is fairly straightforward. Most of the levels require you to simply move the hole around, and engulf the detritus in the level in size order, beginning with the smallest blades of grass, up to the large buildings, as well as the individuals who mistakenly thought they had ordered a sugary treat from the raccoons. Whilst this puzzling is fairly rudimentary, there are times where you use physics to make items fit holes by tipping them on their sides, creating an extra layer of thinking. Also there’s a lot to be said for the catharsis of simply destroying entire settings and seeing them plummet through the hole into the void. It’s difficult to articulate, but wanton destruction is just satisfying, especially knowing that not even large structures are safe from your all-consuming hole of death. What also makes it so entertaining is what’s going on alongside the gravity-manipulating shenanigans. Firstly the humour in is quirky and endearing. The banter between Mira, BK and the other residents is quite funny at times, and serves as light comic relief against the backdrop of the despairing situation they all find themselves in lost underground. All BK wants is a quadcopter, that he can only get by leveling up his hole app, seemingly oblivious to the disastrous ramifications of his selfish behaviour. Mira is the voice of reason, but has a scathing comment or two up her sleeve for BK when it is required. And the residents range from illegal fireworks dealers to those who love chickens just a little too much. It creates a ramshackle cast that you enjoy the interactions of in between the main levels. The visuals are also clean and have a charming aesthetic. The clean and crisp low polygon character models and design of the various locations reinforce the game’s ultimately eccentric tone that perfectly back up the whimsical gameplay and quirky humour. The sound design is also very good, with delightfully delicate tunes and tones during most of the experience, and then more abrupt sounds during moments of panic or tension, either in gameplay or playful conversation between the residents. 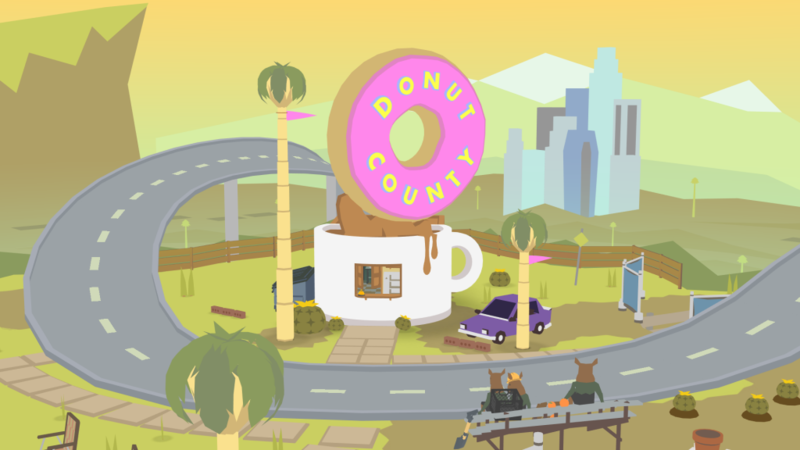 It serves to wrap up the Donut County package nicely. In addition to the standard “put stuff in a hole” mechanic, there are some slightly more complex puzzling. You might need to heat up your hole to light fireworks to have an impact on the landscape, for example. There’s also a catapult add-on that allows you to fire certain objects you have swallowed back out of the hole into the environment to solve puzzles. This might be swallowing said lit firework to then fire up at a different location to have the desired effect. These parts of levels provide a nice change of pace and are a welcome addition, causing you to use a bit of grey matter, rather than mindlessly consuming everything with your ever-expanding hole. There is a sticking point that is worth highlighting, and that is the depth and length, because both come up fairly short. The game is only a couple of hours long, with most of the levels taking a couple of minutes to complete, and nothing ever providing much of a challenge. It’s a fairly shallow experiences which is ironic given the gaping hole mechanic you’re asked to control. Unfortunately it all feels like it’s over just as it gets started. Whilst it does have a catapult mechanic, there surely could have been more of these changes to the base gameplay included to open up different types of puzzles to keep it fresh. It all culminates in a final boss fight, which is the first of its kind and feels like instead it should be a first boss of many, exploring new ways to use the hole mechanic to overcome different enemies, but unfortunately it runs out of ideas far too quickly. It’s apt then that the central mechanic is a hole, because I couldn’t help but feeling a little empty when it was over. It felt like the potential had been sucked down under Donut County like the rest of the inhabitants, and that’s a shame. Sure the wacky humour and well designed sound and visual aesthetic make what you do play enjoyable, and the cathartic nature of seeing everything succumb to the abyss never gets old. But for the £9.99 price tag it feels like it could have been so much more, with different elements thrown in to mix up the gameplay. 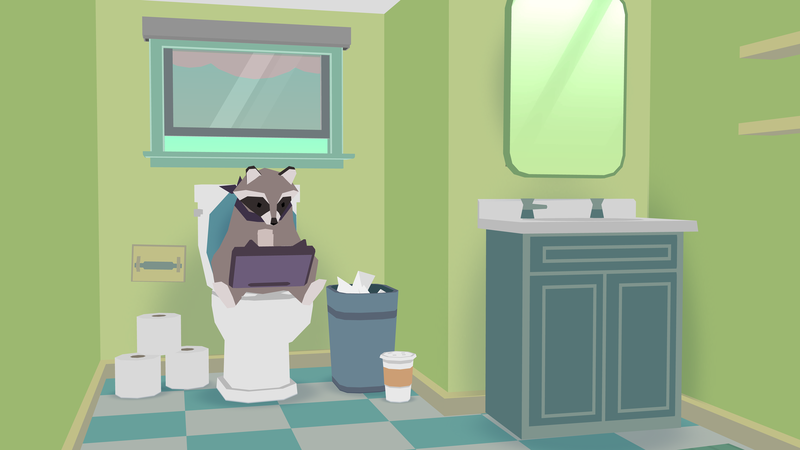 You’ll definitely enjoy what you play in Donut County, but for some, you’ll be left hungry for another bite or two. A nice little game, with emphasis on the little. You'll have a great time in its couple of hours of quirky gameplay, but that might not be enough for some, considering the price.